Want a flexible wardrobe designed for all of your lofty professional pursuits? Grab some deodorant and don’t sweat it—we’ve got your go-to guide to putting together outfits for the office, no matter the dress code. 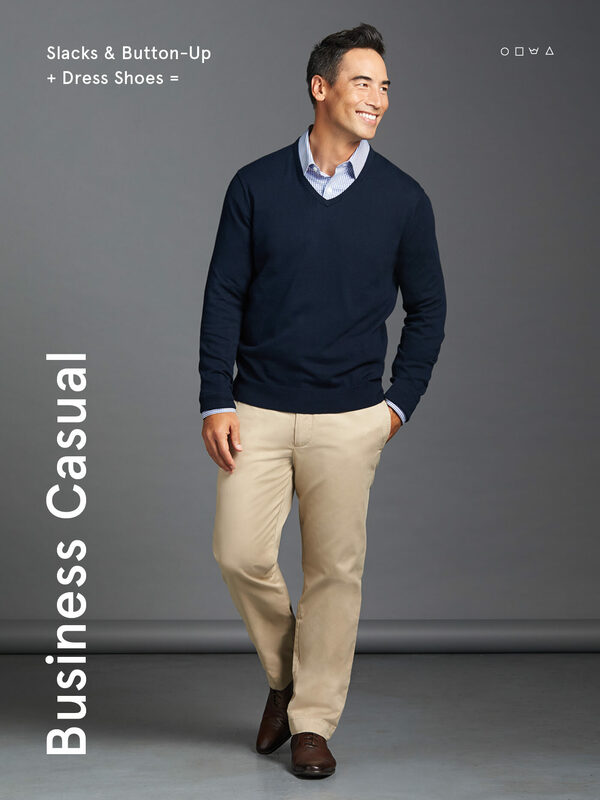 Business casual gives you flexibility with pants, but it’s best to stick to a solid pair of chinos, slacks or khakis. Wool or corduroy pants are cool options that provide a wide range of color and textures. Whichever option you choose, make sure the color is entirely different from the color of your blazer. Tread carefully when choosing denim for a biz-casual environment. But if you see it around the office, be sure to always stick to a darker wash that blends well with sweaters, button-ups and casual footwear. 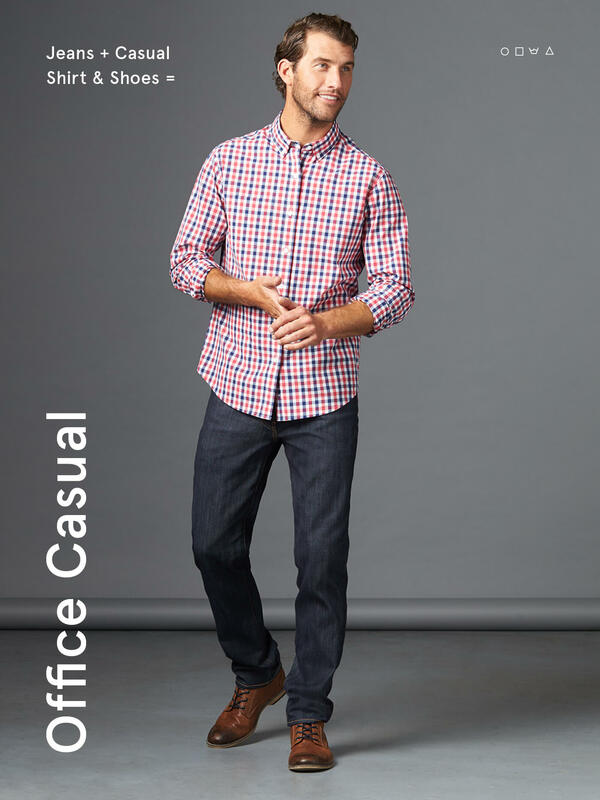 If the name of your casual game is sans tie, then you’ll most likely rely on a sleek button-up. This can be paired with a sport coat or underneath a merino or cashmere sweater. If you want an extra masculine approach, unbutton the top one or two buttons, but keep the shirt tucked. Business casual gives you an opportunity to make a statement with your shoes—and you can safely rely on a derby, Oxford or loafer. Boots can work well, too. If you go that route, stick to a polished leather boot that can be leveraged in both formal and casual settings, as can suede. You can also tap a desert boot (also known as a “chukka”) with a rubber sole instead of a leather one. More than a utilitarian tool, a belt is a signifier that a man can tie his outfit together. “For more casual dress, pair the color of your belt with shoes: brown leather matches perfectly with a brown leather belt, and the same for black.” — Stylist Lisa G.
“If you elect a glossy belt, pair that with a well-polished shoe. The more casual the shoe, the more flexibility you have to work with.” — Stylist Amy J. Visiting clients off-site? Some of these rules go out the window. Err on the side of formal when you need to dress to impress. Enhance your personal brand by creating a unique identity through your style. Stick with dark-wash jeans for a more polished, put-together vibe. Play with patterned and printed shirts more often—have fun with it. Stay away from sweatpants and flip-flops—nobody wants to see your toes in the office. Nobody. No workout shoes—make sure any sneakers you wear are clean and stylish. If everyone in your office is wearing hoodies, it’s best to find a way to stand out. Switch it up every once in awhile, and if you opt-in for a T-shirt, go with a plain shirt, a very simple pattern and a slim fit. When you start wearing your favorite ’90s band tees or something with stains, you’re going too far. In the end, keep it simple. Denim is a staple in many less formal settings. You can still look like a professional with the perfect pair—stick to a fitted jean, with a straight or tapered leg. It’s best to save the distressed, ripped jeans for your next night out. Unless your office is a UPS truck, it’s best to leave shorts for the weekend. Just because you have a super casual environment doesn’t mean you have to show up in a shoe designed for the gym. Opt for a slip-on or old-school trainer like a pair of Vans. Just be sure to keep the style simple and the color choice focused. Boots or leather casual shoes will add an elevated vibe to your overall outfit, so reach for those anytime you have an important in-office meeting—or you’re headed to date night directly after work. Read on for advice on how to dress for a formal, business casual or casual office setting. While we’ve come a long way from your dad’s office, there is still an expectation for many men that hold salaried jobs to carry a distinguished look built around a collared shirt, tie and jacket. If your office setting is somewhere between Mad Men and a Financial District, this is the perfect formula for you. Before you pick your suit, remember this rule of thumb: proper fit is paramount. Make sure the jacket arm sits right to your wrist, the pant leg just above your heel, and the collar shouldn’t restrict around your neck. When buttoned, the jacket should not bunch near your mid-section. If your office is slightly less intense about polished formalwear, spice it up by mix-and-matching your pants and jacket. Solid, timeless choices for jacket colors include black, charcoal or navy. And they each go great with khaki or grey pants. The single-breast suit is the most classic and iconic look donned by politicians and moguls alike, while allowing a more comfortable fit. For the most formal offices, a three-piece will bring the best impression fitting of your career aspirations. When selecting the perfect shirt, it’s best to think in context of your suit coat. It can be easy to mismatch, so if you elect a pattern, make sure it’s only on the shirt or the jacket—don’t combine them together. Go for a button-up versus button-down; you’ll know the difference because a button-down has buttons on the lapel (meant to be “buttoned down” to your shirt—novel). Select complementary colors that aren’t too loud—unless you live in 1980s Miami (with a white suit!) or want to repurpose that “burnt siena” groomsman button-up. Just kidding. Definitely no to both. “If your suit has a pattern, make sure your tie doesn’t.” — Stylist Amy J. “Silk is the most durable and popular choice, and doesn’t easily wrinkle.” — Stylist Lisa G.
“For colder seasons, wool is a good choice. And if you want to dress down your suit just a tad, go for knitted.” — Stylist Patricia K.
It’s the most classic and enduring shoe that pairs well with even the most formal workplace clothing. They come in a variety of styles like wingtip or plain toe, and in a variety of materials like leather, patent leather and suede. Brogue refers to the stitched patterns you’ll find on an Oxford, monk strap or derby shoe—and are a nice style statement to accentuate your suit. Black shoes should be paired with black or charcoal suits. You can choose black or brown with blue, grey and navy suits. Nothing elevates a man’s style better than an accessory. A belt, tie clip or even a silk pocket square can accentuate your look and deliver a million-dollar impression. Whether corporate or casual, schedule a Fix for raise-inducing workwear.